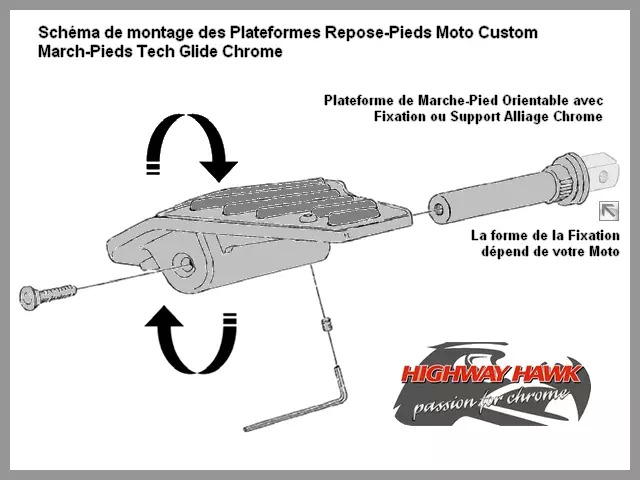 Paire Marche-Pieds Arrières Yamaha Custom XVS 125 650 1100 Drag Star et Classic XV 1600 Wild Star XV 1700 Highway-Hawk Tech Glide Chrome. 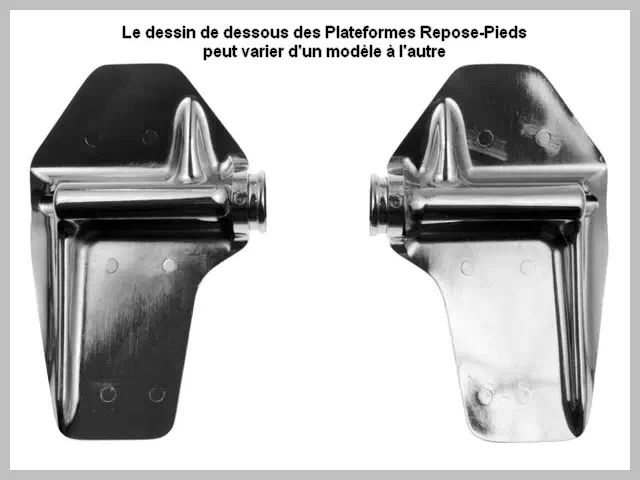 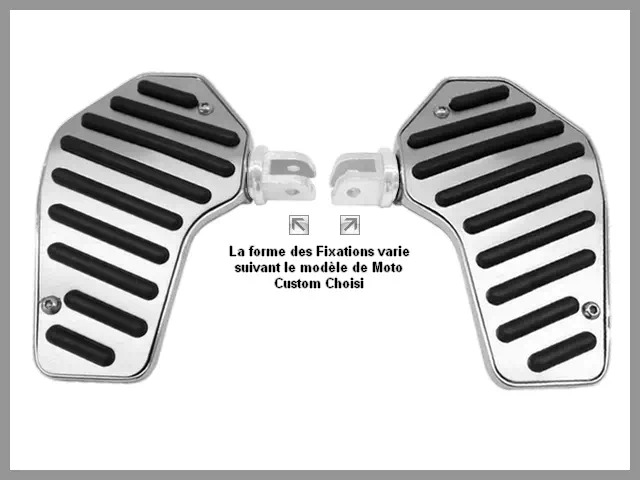 Paire de Plateformes Repose-Pieds Passager pour Yamaha Custom (Affectations Yamaha Vérifiées*) : XVS 125 Drag Star, XVS 650 Drag Star -2003, XVS 650 Drag Star 2004-up, XVS 650 Drag Star Classic -2003, XVS 650 Drag Star Classic 2004-up, XVS 1100 Drag Star -1999, XVS 1100 Drag Star 2000-up, XVS 1100 Drag Star Classic 2000-up, XV 1600 A Wild Star, XV 1600 Road Star, XV 1700 Road Warrior, V-Star 650 Classic -2003, V-Star 650 Classic 2004-up, V-Star 650 Custom -2003, V-Star 650 Custom 2004-up, V-Star 1100 Classic -1999, V-Star 1100 Custom -1999, Road Star Midnight Warrior. 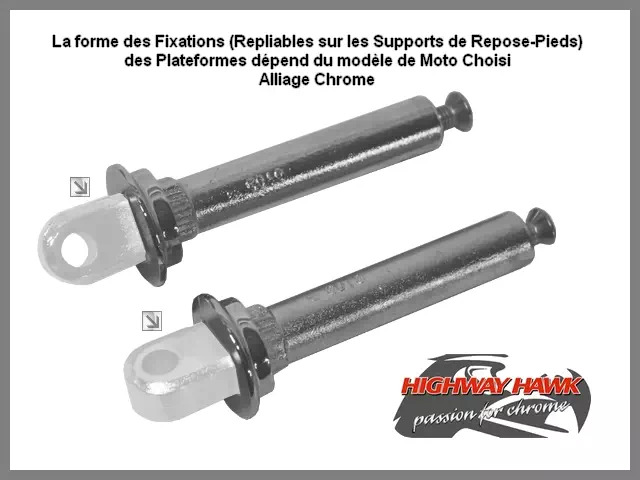 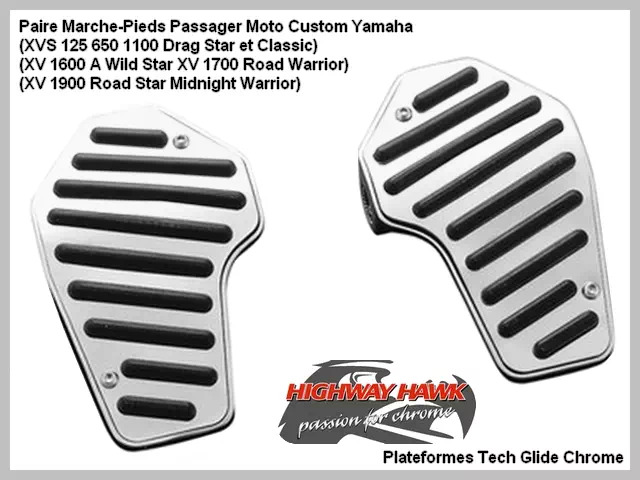 Paire de Marche-Pieds Passager (Arrières) Moto Yamaha Custom (XVS 125 650 1100 Drag Star et Classic, XV 1600 A Wild Star, XV 1700 Road Warrior, XV 1900 Road Star Midnight Warrior) Highway-Hawk Tech Glide Chrome. 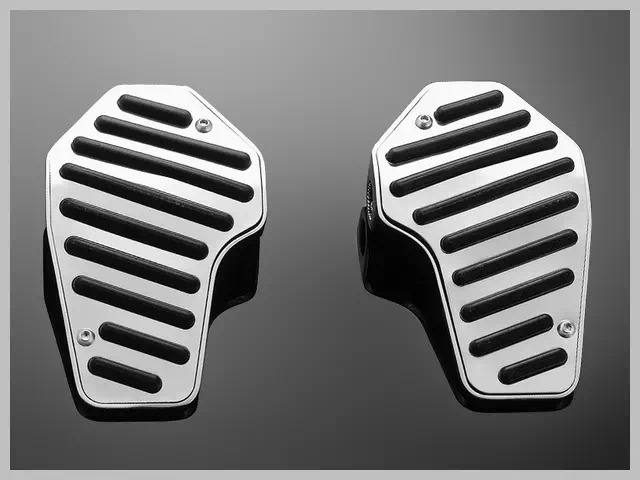 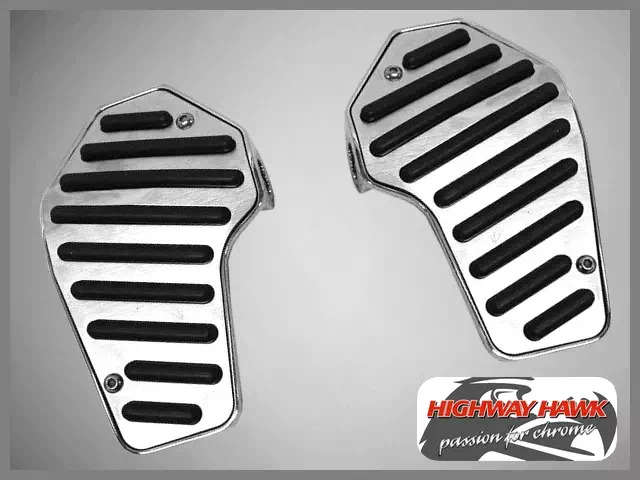 Paire de Marche-Pieds Passager Tech Glide Chrome Yamaha Road Star Midnight Warrior. 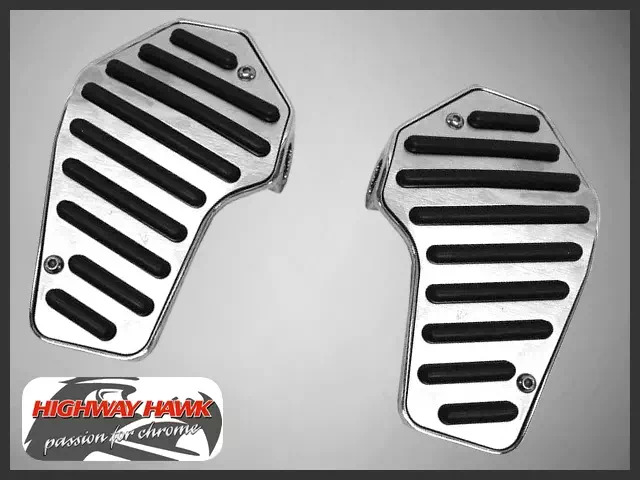 Paire Marche-Pieds Passager Yamaha Custom (XVS 125 650 1100 Drag Star et Classic, XV 1600 Wild Star, XV 1700 Road Warrior, XV 1900 Road Star Midnight Warrior) Highway-Hawk Tech Glide Chrome. 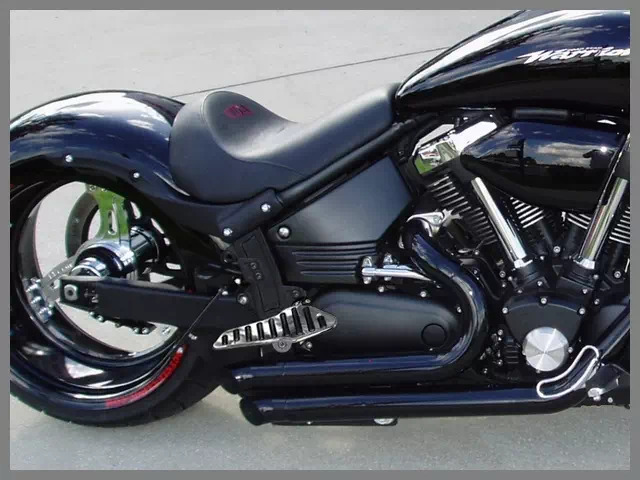 XVS 125 Drag Star, XVS 650 Drag Star -2003, XVS 650 Drag Star 2004-up, XVS 650 Drag Star Classic -2003, XVS 650 Drag Star Classic 2004-up, XVS 1100 Drag Star -1999, XVS 1100 Drag Star 2000-up, XVS 1100 Drag Star Classic 2000-up, XV 1600 A Wild Star, XV 1600 Road Star, XV 1700 Road Warrior, V-Star 650 Classic -2003, V-Star 650 Classic 2004-up, V-Star 650 Custom -2003, V-Star 650 Custom 2004-up, V-Star 1100 Classic -1999, V-Star 1100 Custom -1999, Road Star Midnight Warrior.